The mere sight of Idly, Vada or Dosa is enough to send South Indians into an orgasmic frenzy of dripping excitement. Seriously, I should know. I'm a South Indian after all! 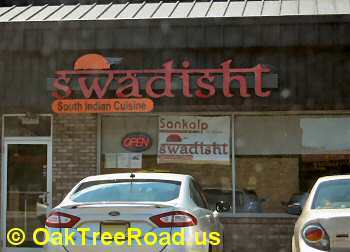 Swadisht, like its predecessor Sankalp, is one of many Indian vegetarian restaurants dotting Oak Tree Road in Edison. 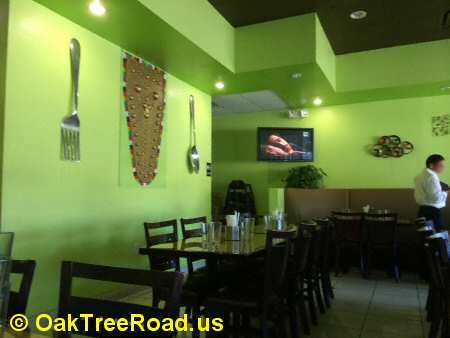 It offers primarily South Indian items on an extensive menu. 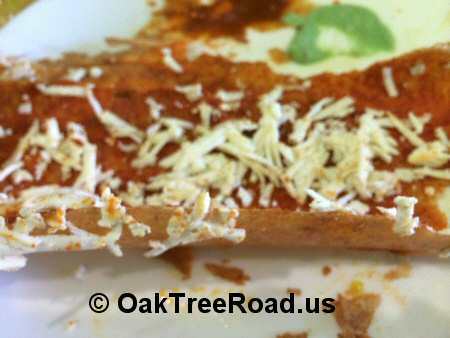 During a recent visit to Oak Tree Road, Swadisht was my first stop. When I walked into Swadisht during lunch hour, the restaurant had around eight customers digging into their Dosas, Medhu Vadas and Idlis. A middle-aged Indian waiter greeted me with a smile and allowed me to take a table of my choice. Soon another waiter deposited a water jug and menu on my table. Tables were clean and included a Chutney tray with Coconut, Mint/Green and Red Chutneys, and Chutney Powder (Milagai Podi). There was another small tray with napkins, steel forks and spoons. Since the purpose of my life on Earth is to hog Idly, Vada and Dosas, I quickly ordered a Idly-Vada combo and a Dosa Platter for dine in. Subsequently, I placed a takeout order for Bisi Bella Bath. Idly-Vada combo landed first followed by the Dosa Platter. 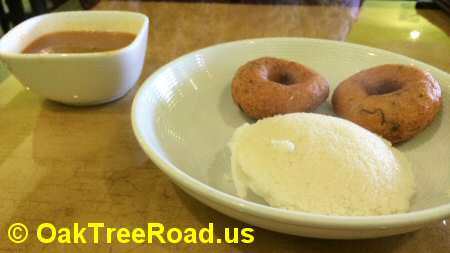 Idly and Medhu Vada to a South Indian restaurant is like omelet for a diner. If a South Indian restaurant can't get Idly or Vada right, then there is no reason for it to exist. My plate included one medium-sized Idly and two small Medhu Vadas accompanied by piping hot Sambar. Fortunately, Swadisht did not fail the litmus test of Idly and Vada. Idly was hot and soft. Both Vadas were crisp and cooked evenly. 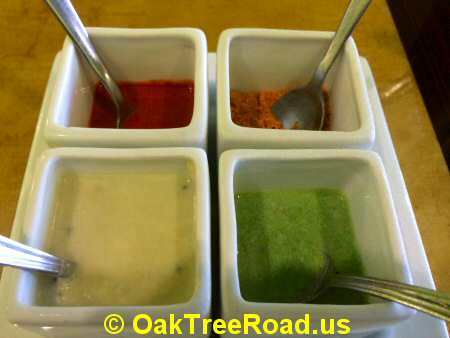 Of the three Chutneys in the Chutney tray, I liked Red Chutney (with a hint of garlic flavor) the most. It was at room temperature and the right spice-level entranced my tastebuds. Coconut and Mint/Green Chutneys were cold and bland disasters. They ought not to have been served to paying customers. When the Chutney tray ran out of Chutneys, a waiter quickly provided me with more Chutneys in a big cup. Chutney powder with a tinge of garam masala flavor was above average. While I liked the idea of keeping Chutney tray, absence of oil to go with the Chutney Powder was irritating. Sambar was flavorful but a bit watery. 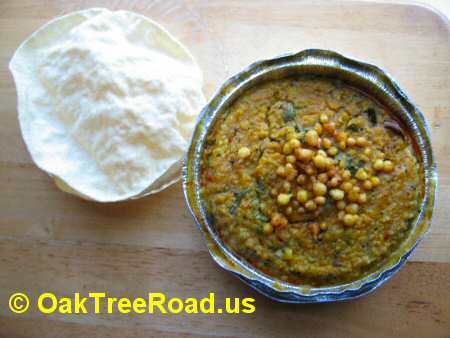 It did not look like a South Indian version which is usually thicker and packs a strong flavor of Toor dal. Unlike a typical South Indian Sambar, it was low on vegetables and included just a few small pieces of Tomato and Onion. But Sambar was unlimited and a waiter moving around with a jug refilled my Sambar cup twice without any prompting. Since the Sambar was flavorful, I'm willing to forgive its shortcomings. Dosa Platter included three mini Dosas - one each of Chettinad Dosa, Achari Dosa and Paneer Dosa. 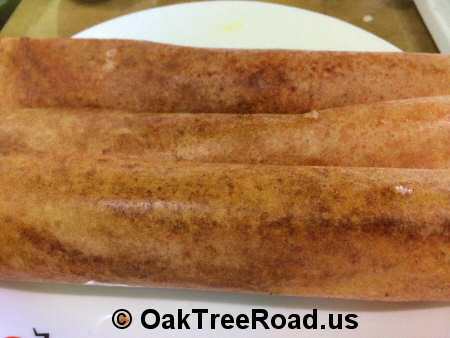 All three Dosas were crisp and came with Sambar on the side. Of the three Dosas, Achari Dosa was most disappointing. You see, it packed only a faint flavor of Achar (pickle). Chettinad Dosa included a filling of spicy Chettinad Vegetable curry. I recommend Chettinad Dosa with the caveat that it could be a little spicier! Smeared with Chutney powder, Paneer Dosa included grated plain Paneer rather than spicy Paneer as claimed by Swadisht's menu. Again, the waiter refilled our Dosa platter Sambar cup without prompting. Elated with my Dosa and Idly-Vada combo, I placed a takeout order for Bisi Bela Bath ($5.50). Bisi Bela Bath, a popular rice dish from the South Indian state of Karnataka, usually packs a nice aroma and taste of fried and powdered Coriander seeds, Cinnamon, Cloves, Red Chilli, Black Gram Dal, Cumin and Fenugreek. Also, Bisi Bela Bath usually includes a variety of vegetables like Green Beans, Carrot, Potato, Onion, Green Peas and is seasoned with Peanuts and curry leaves. In retrospect, ordering Bisi Bela Bath takeout was a huge mistake. For it turned out to be disappointing. Swadisht's Bisi Bela Bath failed at many levels - Absence of spicy flavor, in choice of vegetables used and absence of peanuts seasoning. The Bisi Bela Bath tasted more like Dal rice cooked with ridged Carrots. Also the proportion of Toor Dal and rice had gone awry. It felt like I was eating finely cooked Carrot flavored Dal rather than the yummy, spicy Bisi Bela Bath I am accustomed to. To its credit, Bisi Bela Bath came with a small serving of Boondi on top of the rice and two small Pappadams on the side. And the serving size was decent. Adding Boondi on top of the piping hot Dal rice was another mistake since my order was a takeout. Boondi sprinkled on the rice became soft because of the high temperature and moisture in the dal rice. While I had no complaints about the Pappadams, overall I did not enjoy the Dal rice dished out by Swadisht in the name of Bisi Bela Bath. Service at Swadisht was above average unlike at a lot of Indian restaurants on Oak Tree Road. I was greeted with a smile, served water and our order was taken quickly without making us wait. Sambar refills were provided without any prompting. Chutney refills were given without extra charge. The one irritating thing was absence of oil to go with chutney powder. But they provided me with oil promptly when I asked for it. Bisi Bela Bath was packed neatly in two layered aluminum foil bowls. Pappadams were placed separately in a stapled brown bag. Notwithstanding my disappointment with Bisi Bela Bath and two of the Chutneys, I would revisit Swadisht during my next visit to Oak Tree Road. For it's one of the few Indian restaurants on Oak Tree Road that provides decent South Indian food with above average service.